I learned to make this dish a long time ago. 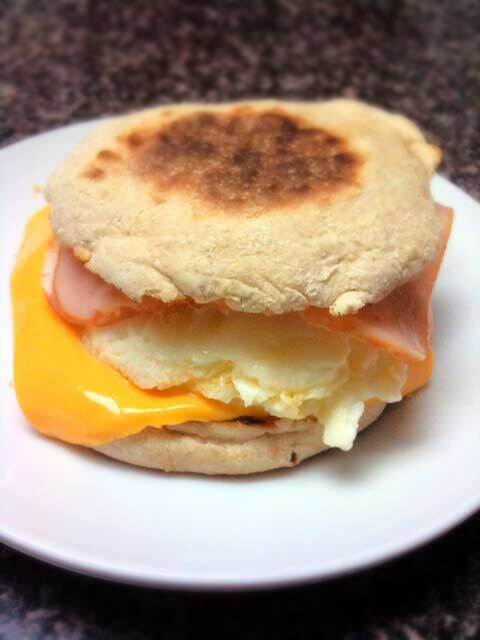 It was fashioned after my favorite breakfast item from the Mcdonald’s menu, the Egg McMuffin. It is a very simple dish to make. You can have it ready in less than two minutes. After this recipe, there is no excuse for missing the most important meal of the day. The simplicity of the dish requires the use of a microwave and a toaster oven. It is the only way to have the breakfast that fast. You start toasting the muffin in the toaster oven. Then you nuke the egg in the microwave. By the time the toaster oven finishes, the only thing left to do is to assemble. Slice the English muffin in half to get two pieces. Toast them in the toaster oven on medium. On a microwave safe cup, add 1 teaspoon of butter. Melt in the microwave for 20 seconds. Move the butter around to coat the bottom part. Be careful the cup will be hot. Crack the egg. Add the egg in the cup with the melted butter. Cook for 1 minute on the microwave. Put the bottom part of the muffin on a plate. Place the cheese on top of it. Turn over the cup over the muffin and the egg should slide off. If it does not slide off you did not coat the cup with butter correctly. Add the ham. Place the top part of the muffin. Variations — You can use bacon, or other types of cheeses. You can also add a slice of tomato, or onions. The cooking time for the egg will differ according to your microwave.